Cedar Point Mill in Cedar Point, Kansas, now and c. 1910. NEH funding helped establish Lost Kansas Communities, now a thriving program of the Chapman Center for Rural Studies at Kansas State University. Image courtesy of the Chapman Center for Rural Studies. 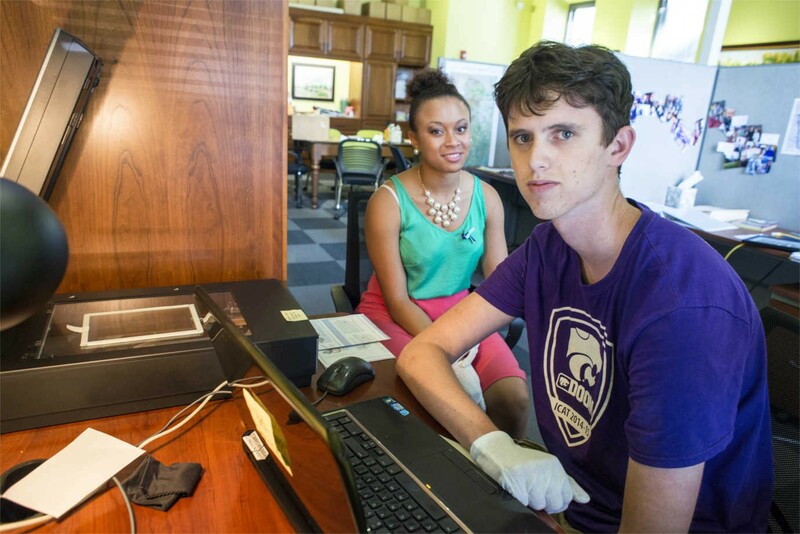 Established with a grant from the National Endowment for the Humanities, Lost Kansas Communities is an innovative digital project that saves the memory of Kansas’s lost and disappearing locales and a major program of the Chapman Center for Rural Studies at Kansas State University. KSU students—more than 500 at last count—perform primary research, combing archives, creating maps, and documenting oral histories. Only the best of their final products make it to the project’s digital archive, where the stories are publicly accessible to any who are interested in Kansas history or rural studies. KSU students perform primary source research as part of the Lost Kansas project. Image courtesy of the Chapman Center for Rural Studies. In addition to creating a record of rural life in the state, Lost Kansas Communities instigated a wave of public outreach from the university to local communities and inspired a number of individual and organizational donors to support the Chapman Center’s work. Inspired by Melvyn Bruntzel, who authored a book on Lost and Missing Towns and Places of Kansas, the Chapman Center created the Bruntzel Prize in Local History, given for outstanding contributions to the state.The center has digitized Bruntzel’s book, as well as preserving and digitizing the collections of many local historical societies, individuals, nonprofits, and corporations. And in partnerships with the Flint Hills Discovery Center, the Chapman Center mounted a major exhibition, Going Home: Hidden Histories of the Flint Hills, in 2016. More than 17,000 people visited the exhibition during its three-month run. Video courtesy of the Chapman Center for Rural Studies. Since the NEH funded Lost Kansas Communities, the Chapman Center has been the recipient of substantial donations, including those from KSU’s Center for Community Engagement and Civic Discourse, The Brunswick Corporation, the CHS Foundation, and the JS Penny Fund. Mark C. Chapman, the center’s founding donor, left a bequest to the Center of $3 million, which is now endowed to support its work. And in December 2017, the National Endowment for the Humanities awarded the Chapman Center a new grant. Building on Lost Kansas's success, this funding will help train staff and volunteers in rural Kansas communities to preserve their own heritage collections.